Cheers to Our Local Growers & Tasters! Contemporary Beer & Modern Street Food Serving Lunch & Dinner 7 Days a week! Did you know that $3 provides five meals to Vermonters in need? Select restaurants are donating $1 to the Vermont Foodbank from every meal sold. — Special events throughout Restaurant Week also benefit the nonprofit. — City Market, Onion River Co-op is donating 40% from its Rally for Change initiative during the entire month of April. The Vermonter is a celebration of our home, one of the world's best places to grow apples and a food business. Thanks for helping us raise $95,375.32 (and counting) for the Vermont Foodbank during the last 10 years. Let’s keep it up! Grab a pair of scissors, a pen and maybe some Post-it notes before you snuggle up to this guide. These tools will help you keep track of your favorite menus. Pro tip: Use the index and handydandy planner on page 8 to stay super organized. Is your sister a vegetarian? No problem. 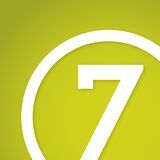 Use the search tool on vermontrestaurantweek.com to browse restaurants by region, cuisine type, price and meals served. Even the pickiest of eaters will find this feature satisfying. It’s better to be safe than sorry! Once you’ve narrowed down your favorite menus, make a reservation. Not all restaurants take them, but we suggest calling ahead. Can’t make it to dinner? Some restaurants are offering breakfast, lunch and brunch specials, too. If you’re feeling feisty, you could eat out for every meal! Whoa. Treat yourself! Restaurant Week is a great excuse to sample the tastes of Vermont with a hot date or with friends. WHO’S GOT THE RECIPE FOR SUCCESS? As you flip through this guide, take note of menus that excite and entice your taste buds! This year we invite you to tell us who the real taste makers are by voting for your favorite menus during Vermont Restaurant Week. The restaurants put a lot of love into their menus. Now show them some love. Go to vermontrestaurantweek.com and write in your nominations by Sunday, May 5, at 5 p.m. You can only vote once per category, so make it count. All participants will be entered to win a gift card to a local restaurant. Throughout the week there are several special events, including the Sweet Start Smackdown, Pints & Poses Yoga, the Sensory Social, a Culinary Trivia Night, the Dish and cooking classes (see page 6). If your dining companion isn’t interested in the official Restaurant Week menu, never fear! Most restaurants will be serving their full menus in addition to their special offerings, so there will be plenty to choose from. Post to social media or it didn’t happen! Share your dining adventures with the world and remember to use #vtrestoweek. Road trip? Winter is over, so take the highway — or the back way — to a new dining destination. You can check off some towns on your 251 list along the way! Forget about the calories and have a pair of sweatpants handy. 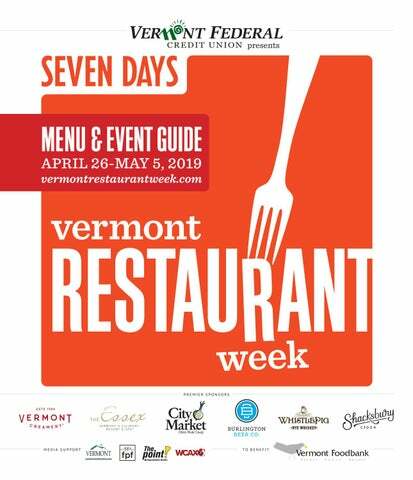 oin us for a fun and flavorful competition to kick off Vermont Restaurant Week! Local pastry chefs from every corner of the state compete as foodies feast. Scores from celebrity judges and votes from you decide the winner of Vermont Restaurant Week’s Signature Sweet. Guests have an hour and a half to taste every tempting dessert, and three tokens with which to choose their favorites. Proceeds benefit the Vermont Foodbank. Fermented food and beverages have recently risen in popularity, but the ancient technique has been around since the Stone Age. Traditionally used as a means to preserve food, the technology has evolved to encompass a broad range of flavors and products while shaking up the culinary landscape. From bread to beer, kombucha to kimchi, fermentation plays a role in much of the food and drink we consume each day. Join us for a special Restaurant Week edition of the Dish to explore the wild world of fermentation. We’ll hear from brewers, farmers, chefs and business owners about their experiences with fermented products while exploring claimed health benefits, opportunities to preserve local food, and whether this food trend is here to stay. Special thanks to City Market, Onion River Co-op and the Intervale Center. $5 suggested donation (benefits the Vermont Foodbank). Register at vermontrestaurantweek.com. Whistle while you cook at the Essex Culinary Resort & Spa. Students will learn from one of the Cook Academy chefs how to prepare a three-course meal featuring WhistlePig whiskey. $98. Space is extremely limited. Visit essexresort.com to register or call 878-1100. Join Corey Grenier for an alllevels foodie flow in the brewery. This hourlong vinyasa-style class will focus on digestion, detoxification and mindful eating. End your practice with a pint or flight! Please bring your own mat. $20 donation includes the yoga class and a pint or flight (benefits the Vermont Foodbank). Register at vermontrestaurantweek.com. Feed your brain with foodie trivia and compete for delicious prizes at this rowdy event emceed by Top Hat Entertainment. Grand prize: $500 gift card to Hen of the Wood! Suggested $5 donation at the door (benefits Vermont Foodbank). Team registration required at vermontrestaurantweek.com. Cider and cheese? Yes, please! Join Shacksbury and Vermont Creamery for a fruitful and fraîche guided tasting that will make your senses sing. Come hear from the experts; taste, smell and touch their products; and see why these flavors are so complementary. $15 donation (benefits the Vermont Foodbank). Get tickets at vermontrestaurantweek.com. Menus will be offered for dinner April 26-May 5 unless otherwise noted. Some are abridged for space. Reservations are recommended for all. For the latest info, visit vermontrestaurantweek.com. Three courses from everyday and special menus. See a sample menu at bluemoosebistro.com. Choice of any entrée on the menu; samples below. TELL THE WORLD HOW GREAT VERMONT TASTES! $21 Like us on Facebook and mention us in your posts! Includes 12-ounce drink, appetizer, entrée and dessert. Includes 12-ounce drink, entrée and dessert. Strawberry fruit filling and Belgian white chocolate mousse between shortcakes; pairs well with Champagne! Herb vinaigrette. *Add warm Vermont Creamery goat cheese or Great Hill Blue cheese for $2. Like us on Facebook and mention us in your posts! Spring menu not available at press time. For an updated menu, please visit vermontrestaurantweek.com/bar-antidote. Spring menu not available at press time. For an updated menu, please visit vermontrestaurantweek.com/ hired-hand-brewing-co.
We will be open 5-9 p.m., Wednesday through Sunday, during Vermont Restaurant Week. Choice of fries, pub chips or a side salad. $40 Like us on Facebook and mention us in your posts! Cork Wine Bar & Market 35 School St., Stowe, 760-6143 Vegetarian option available. Includes choice of draft beer, salad, two tacos and dessert. Add beer for $20. During Vermont Restaurant Week, the Blue Paddle Bistro will be open Tuesday through Sunday (closed Monday). Served with fries, pub chips or a side salad. Everything on the menu is gluten-free. Breakfast boost available all day. Afternoon tea is 1-5 p.m.
$1 from every cocktail sold will go to the Vermont Foodbank. Includes starter, main course, dessert (special cocktails additional). We will be offering special cocktails featuring the boozy Restaurant Week sponsors. VOTE FOR YOUR FAVORITE MENUS! and write in your nominations by Sunday, May 5, at 5 p.m.
We recommend pairing these entrées with our Elaborate Metaphor (NE pale ale) or Uncanny Valley (NE IPA). With homemade coffee whipped cream. We recommend pairing this with any of our dessert Stouts or our Barista (coffee porter). 5 Bartlett Bay Rd., South Burlington, 658-2739 Includes choice of beer (full pour) or a flight! $20 BRUNCH With choice of cucumber Bloody Mary, Jameson and ginger, or house mimosa. Includes: appetizer, entrée, choice of pork-fried or white rice. See complete course options at mandarinvt.com. Menu may change throughout the week due to availability. Every meal includes three courses, plus a small starter bite and a palate-cleansing snack. All Restaurant Week specials are available for dine-in only. Sign up for the Bluebird Barbecue newsletter and we’ll donate $1 to the Vermont Foodbank! Available for dine-in only, Monday through Friday, 8-10 a.m.
With the featured cider, it’s an addtional $5. Choice of All Souls Tortilleria corn tortillas, hard-shell tortillas or flour tortillas. All entrées include traditional West Indian rice and peas or a house side salad. Includes: Dumplings, two orders of pad kea mow, one dessert. All served with house BBQ sauce, pickles, slaw, honey butter biscuit. Complimentary Brio Coffeeworks Juniper Brunch Blend coffee with any brunch food purchase. 156 St. Paul St., Burlington, 489-5644 Includes antipasti, insalate, pizze and dolce; no substitutions, please. 123 Church St., Burlington, 860-9401 Full descriptions online. Courses available à la carte; vegetarian options provided upon request. All curries served with rice and papadam (crispy chickpea wafers). $10 BREAKFAST DEAL Available for dine-in only, Monday through Friday, 8-11 a.m. Available for dine-in only, Monday through Friday, 11 a.m.-5 p.m.
Includes a cup of soup and any sandwich or specialty salad. Add a flight of four Vermont Pub & Brewery beers for $5. Enjoy great food, and get rewarded for supporting local restaurants. Earn double points for every dollar you spend in a Vermont restaurant from April 26th through May 26th. * Don’t have a Vermont Federal credit card? Sign up for one today at vermontfederal.org or call (888) 252-0202.